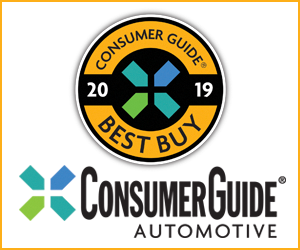 Consumer Guide®’s reigning “Best Buy” in the premium-large-SUV segment is not abdicating its throne for 2017. Its mix of power, towing capacity, luxury, convenience, and sheer presence keeps it a king of the road—even in spite of a few flaws. All Escalades are 3-row vehicles with nominal 7- or 8-passenger capacity (depending on the seating arrangement), but some are roomier than others because this king-size Caddy comes in two sizes. CG drove the “junior” Escalade, which is 20.3 inches shorter overall than the Escalade ESV. ESVs cost $3000 more than comparable Escalades, but they come with a roomier third-row seat and additional cargo space. Standard-length Escalades are almost 20 inches shorter than the long-wheelbase Escalade ESV models. For all of its luxury-nameplate connotations, the Escalade is a rugged truck down deep, with a traditional-as-tweed structure: body shell bolted to a separate full-length frame. The “shorty” Escalade shares its core with the Chevrolet Tahoe and GMC Yukon, while the ESV is kin to the Chevy Suburban and GMC Yukon XL. Both sizes of Escalades come in the same choice of four trim levels, and all can be had in either rear-wheel or 4-wheel drive. CG’s 4-wheel test vehicle was a Premium Luxury example, which is the second-from-the-top trim, behind only the Platinum. There’s plenty of front-row space in Escalade. The Kona Brown with Jet Black Accents package will set shoppers back an additional $2000. Introduced in its current form for 2015, the Escalade has received some feature upgrades since then, but no major changes. New items for ’17—all of which were on the test truck—include a rearview camera mirror, automatic parking assist, and 22-inch-diameter alloy wheels. 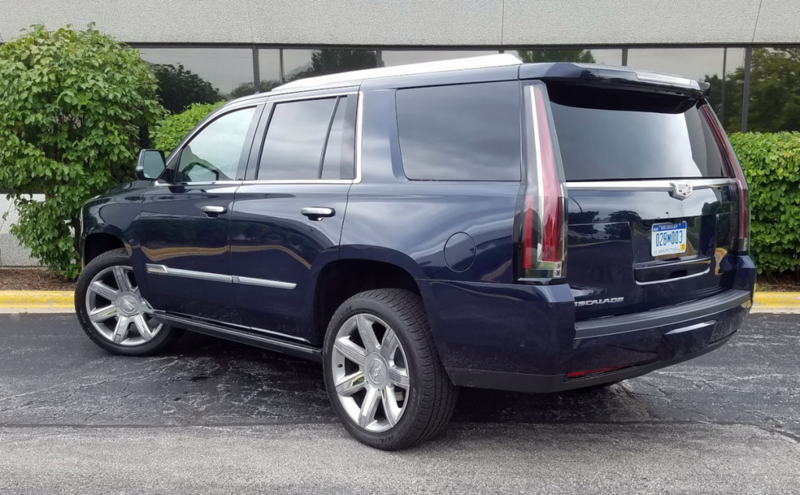 The things that elevate a Premium Luxury Escalade from the Luxury model a rung down the ladder are adaptive cruise control, front and rear automatic braking, automatic seat-belt tightening, rear-seat video-entertainment system, illuminated exterior door handles, and LED cornering lamps. Except where noted, every other feature mentioned elsewhere in this review is a standard-equipment item. The powerteam continues as a 6.2-liter V8 rated at 420 horsepower and a substantial 460 lb-ft of torque, paired with an 8-speed automatic transmission. This strong and effective duo delivers good service in town or on the highway, with fairly prompt response to throttle inputs and timely gear kickdown when a burst of power is needed. There’s a little bit of elevated engine noise under acceleration but enough oomph to let the 4×4 Escalade tow as much as 8100 pounds—or 8300 pounds in rear-wheel configuration. The fuel-economy picture is less encouraging. Even with cylinder-deactivation—the 6.2 toggles seamlessly from 4-cylinder to 8-cylinder operation depending on engine load—the EPA ratings for the 4-wheeler Escalade are 15 mpg in the city, 20 mpg on the highway, and 17 combined. With 70 percent of his 177 test miles in city-type driving, this driver recorded just 13.1 mpg. Ride can be a bit pitchy in turns, with the kind of body roll you’d expect from a tall, heavy vehicle. Even with the big wheels, bump absorption is very good, so passengers get gentle handling over rough surfaces. 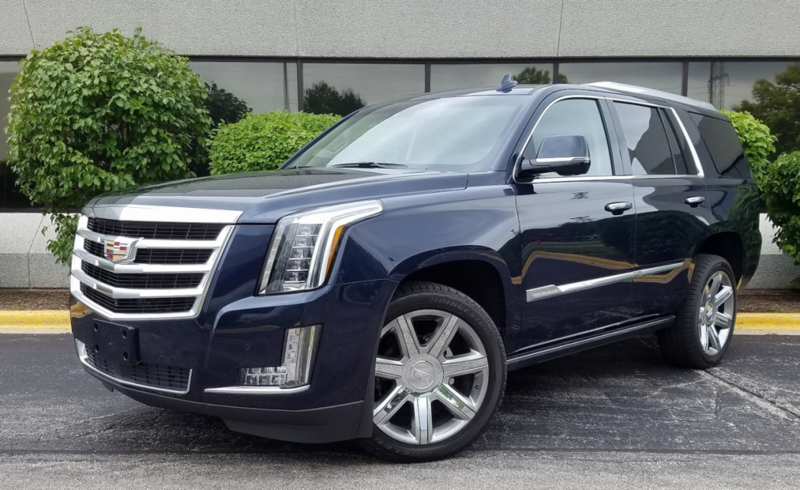 The 116-inch-wheelbase Escalade steers easily enough but with its considerable overall size and height, it’s not the most nimble thing—the parking assists, surround-vision camera, and the mirror that turns into a video screen will be welcome for getting in and out of spaces. 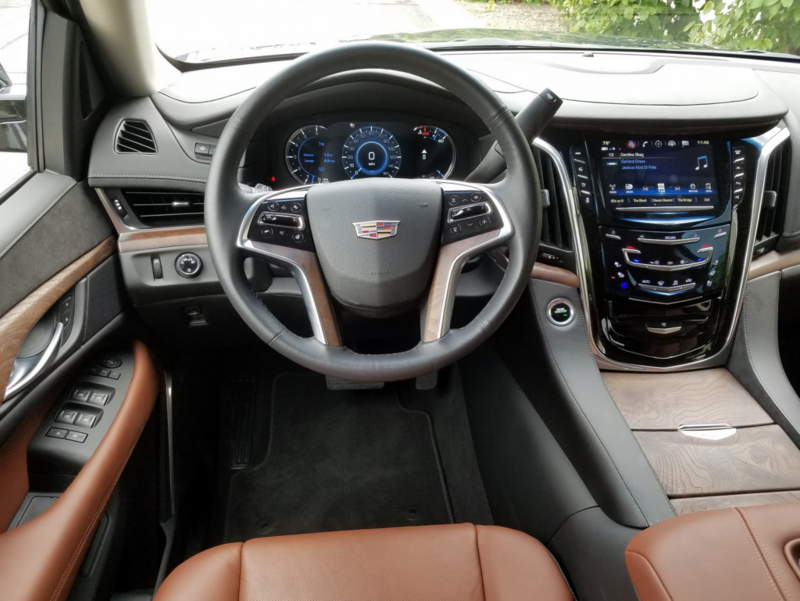 The Escalade’s second-row seats are spacious enough for most adults, but the third-row seats in standard-length models are best suited for small, nimble passengers. Equipped with second-row bucket seats, CG’s test truck was a 7-passenger Escalade. (An available bench seat in place of the buckets adds one more seating position.) If you ask this reviewer, the rearmost three will have to be kids. For one thing, no more than two adults could fit in the third seat—and neither of them is bound to be happy about it. The cushion is low, and leg- and headroom are limited. Front and middle-row passengers will find good space. The workings for the power sunroof reduce headroom near—but not directly over—front and middle occupants. With the 4-wheeler’s high stance, owners will want the optional power-retractable running boards, especially if they expect to be transporting the very young or the very old. Cargo space expands dramatically as the third- and second-row seatbacks are folded flush with the load floor. However, the rather tall height of the load floor can complicate the loading of large, heavy items. Front seats with 12-way power adjustment are upholstered in leather, and heated and ventilated. Second-row seats are heated. There’s ample dispensation of soft-surface materials on the dash and console, and on the doors through the armrests. Rich-looking open-pore wood adorns the dash, doors, and console. Other comforts and conveniences include wireless charging for compatible smartphones, a heated steering wheel, and push-button starting. 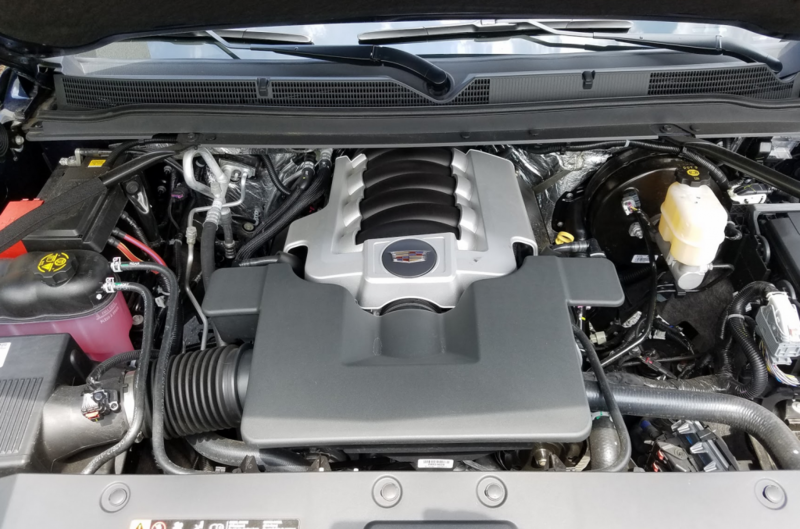 The Escalade’s 6.2-liter V8 is a cousin to the engine found in the Chevrolet Corvette, and sounds the part. The 420-hp engine moves the big Cadillac with authority. Cadillac’s CUE infotainment system is standard. It displays on an 8-inch color screen in the dash above stacks of touch-point “buttons” to govern the 16-speaker Bose audio system, navigation, trizone climate system, and other functions. It’s all brightly visible, and desired functions can be summoned by a finger tap on the screen, but this driver found swiping through the band of radio presets at the bottom of the screen to be a sometimes-futile—and attention-diverting—exercise. At least the voice commands seem to work well. Temperature and fan-speed settings are made by repetitive taps on the button icons on the face of the panel beneath the touchscreen. It takes some familiarization to be able to go directly to the desired control. Middle-row passengers have their own climate controls on the back of the center console. Driving gauges are virtual displays with multiple functions displayed on the electronic dial faces. To cycle through or change the information on any of them requires using a thumb lever on the steering wheel to select the desired dial, then toggling up or down through information menus. A head-up display is standard but it fades when viewed through polarized sunglasses. Cabin storage is quite good, especially in a cavernous covered console box. Cup holders are provided for all seven occupants. The “bobtail” Escalade has a narrow space for just 15.2 cubic feet of cargo with all seats in place. However, lowering the 60/40 third-row seats presents much better capacity. The power tailgate is supposed to be a “hands-free” unit but I’m still waiting for any Cadillac SUV to respond to the motion of my foot under the rear bumper to open the hatch. Tall windows afford the driver excellent all-around vision—though raising the rear seats trims a little from the straight-back view. With delivery and $4345 in options, the test Escalade came to $91,435. It’s a princely sum but it buys a ruler of the road. Included on Premium Luxury models are 22-inch alloy wheels. 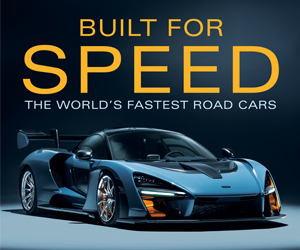 Written by: The Daily Drive staff on August 3, 2017.on March 22, 2019.